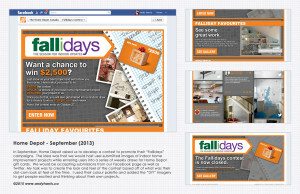 Home Depot – September (2013) In September, Home Depot asked us to develop a contest to promote their “Fallidays” campaigns. The idea was that we would host user-submitted images of indoor home improvement projects while entering users into a series of weekly draws for Home Depot gift cards. We would be accepting submissions from our Facebook page as well as Twitter. 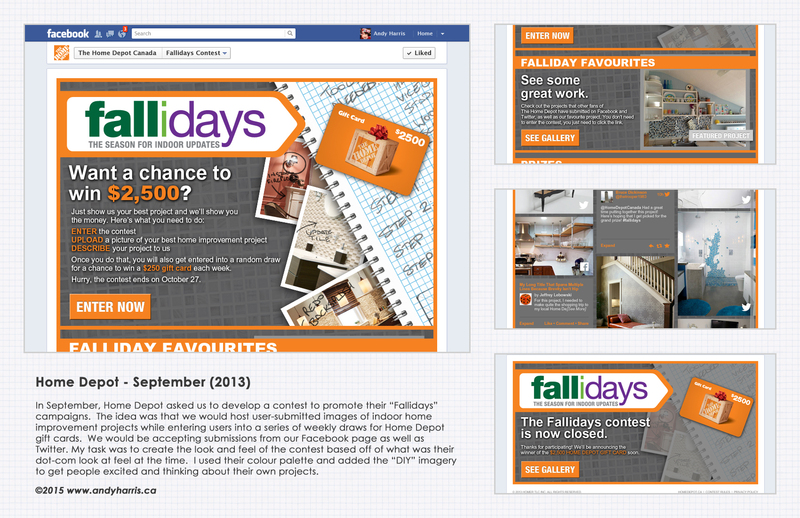 My task was to create the look and feel of the contest based off of what was their dot-com look at feel at the time. I used their colour palette and added the “DIY” imagery to get people excited and thinking about their own projects.